Environment Dress is a smart dress that measures the aggressiveness of the environment to analyze how it affects people’s mood and behavior. The natural sensors of our body are not able to alert us to external environmental factors. However, through the use of technology, we can know how these factors affect us and anticipate them. 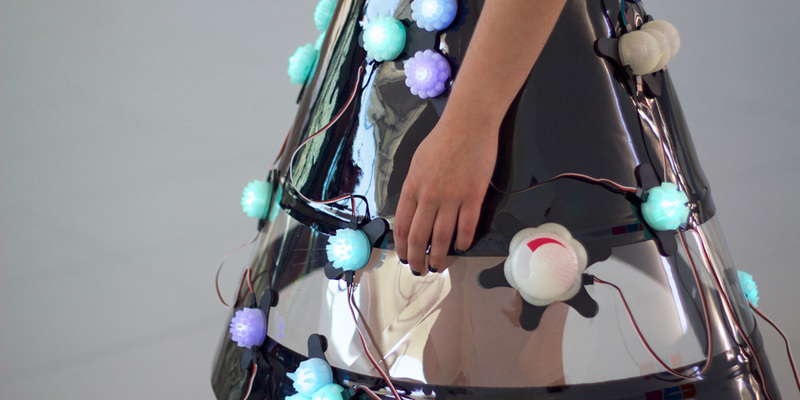 Environment Dress is a wearable equipped with sensors that analyze issues such as variations in noise, temperature, atmospheric pressure, ultraviolet radiation, or the amount of carbon monoxide present in our daily lives. All of this geo-located information is connected to the user’s mood via an app. In this way, thanks to so-called “machine learning”, the garment is able to learn and anticipate the emotions of its user, linking specific environmental conditions with our previously recorded emotions. Environment Dress is a project created in open code. On the project web site, you can find all the documentation about it. uh513 is composed of María Castellanos (ES) and Alberto Valverde (ES). María Castellanos has a degree and a PhD in Fine Arts from the University of Vigo. She investigates the body, specifically the perception and sensory deficiencies of human beings. She focuses on the hybridizations between cyborgs and wearables as a paradigm for the expansion of human sensory capabilities. Alberto Valverde is an artist and technologist with a solid experience in system design, creating interactive environments, web design, and robotics. He has also taught courses on multimedia to Fine Arts students at the University of Vigo. In his work, he investigates chaos as a form of order.